New Delhi, April 2: After arriving on Reliance Jio Phones in September 2018, messaging app WhatsApp is now available on Nokia's '8110' with India becoming the first market to receive the update in Nokia's feature device, HMD Global, the home of Nokia phones, announced on Tuesday. The slider banana 4G feature phone is designed with intuitive tactile mechanics with slide to answer and end calls as well as a helicopter-style spin on its axis. "We're so happy that our fans in India will get WhatsApp on 'Nokia 8110' first anywhere in the world," said Ajey Mehta, Vice President and Country Head - India, HMD Global. Running the web-based mobile operating system (OS) KaiOS, the phone supports VoLTE calling and comes equipped with pre-loaded Google apps like Assistant, Maps, Search and other apps like Facebook, Outlook and Gmail. 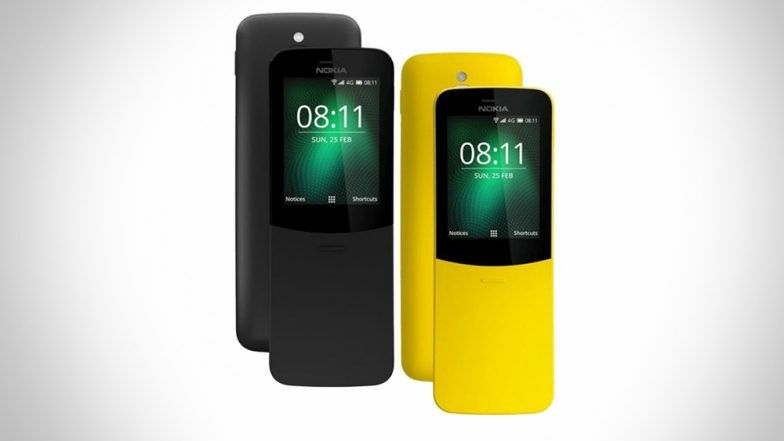 Nokia 3.1 Plus, Nokia 8110 4G Banana Phone Launched in India.